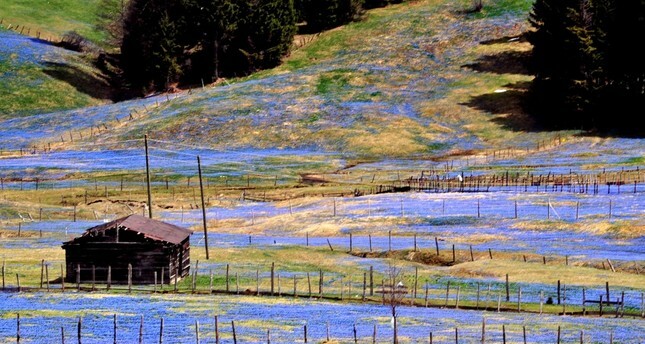 The Kadırak Highlands in Trabzon is a natural protected area to set aside to protect blue star blossoms. In winter, the Kadırak Highlands in Trabzon's Tonya district is no different from any other highland in the Black Sea region. It is situated on higher ground and is known for its clean air and untouched flora. With the arrival of spring, however, it turns into a field of purple flowers that cover the entire area, offering a delightful scene. The flower, called "blue star," is protected under the Berne Convention and only blooms for three weeks. The flower is so rare and beautiful that the locals protect every single one of these purple wonders. Osman Karabulut, one of the residents of the highland, said he is worried about the flowers and the highland is jammed with tourists who want to see this wonder. "Our visitors can come and take photos but we ask them not to destroy the flowers. I put fences around my garden so that I can protect the flowers around my house. Our priority is to protect these 'blue stars,'" said Karabulut. People from all over Turkey, as well as nature and botanic enthusiasts from all over the world, visit the Kadırak Highlands this time of the year to witness the blooming of these rare flowers. Gökçe Ofluoğlu, a first-time visitor, said: "This is my first time in the Kadırak Highland. While we are wandering around the gardens, we are very careful not to step on the flowers. However, there are people playing football on these flowers. They bloom for only three weeks. We have to be more careful."